BETA ONLY: products are not yet available. All GroupWyse software products are currently in a 'beta' development program and are not yet available. The content below is likely to change, and product availablilty has yet to be determined. Some download links are currently unavailable. When the PingView application runs, it scans a set of targets created by its user. This set of targets and all the configuration information accompanying them is called a "collection". In other words, a collection is a PingView "document", and it's usually stored in XML format somewhere in the user's Documents folder. The primary idea of collection storage is that PingViews can transmit collection information to other PingViews. This allows, for example, sub-networks to be represented completely in a "master" network PingView. The diagram below describes the main ideas. 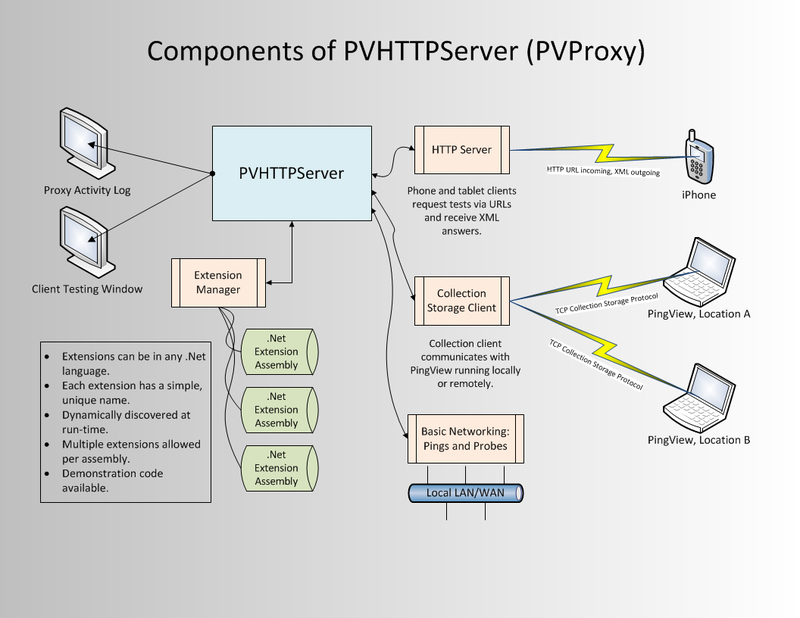 PVProxy (also known as PVHTTPServer), is a simple HTTP server that allows any web-enabled device to obtain network status information. At its simplest level, PVProxy provides a means of "proxying" network tests. If your iPhone is on a cellular data network but you want to test to see if your DVR is on-line, you can "forward" an ICMP "ping" request to the proxy; it will perform the ping in its local network and return the results. For more detailed information, see the diagram below.